Pictured are, from left, Joan Myers, Judy Webb, and Lynn Webb. 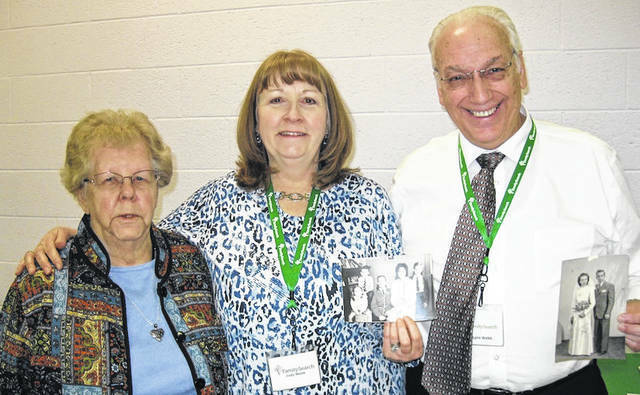 MOUNT GILEAD — Family Search volunteers Lynn and Judy Webb presented the program when the Morrow County Retired Teachers Association met for lunch April 1 at Trinity UM church. The Webbs recently completed a 15 month service mission of digitizing Morrow County wills and guardianship documents dating from 1848 to 1935. Sponsored by the LDS church, which places great emphasis on family history, the information is now stored in the Granite Mountain vault in Salt Lake City and is available to genealogists on the Family Search website. Several retired teachers assisted with the project — Joan Myers, Mary Kay Myers, Ruth Logan, Barbara Brewer and Janet Rhodebeck. Past-president Bonnie Hildebrand conducted the business meeting. She announced the recipients of MCRTA’s recently awarded grants to county classroom teachers to assist with special projects: Leslie Keddie,, Northmor; Katie Schohy, Cardington; Tom Lewis, Mount Gilead and Jennifer Reid and Brett Behnfield, Highland. Membership chairman Sharon Kincade welcomed two new members, Bonnie Beiler and Janet Bixler. MCRTA now has 87 members, 63 of whom are also ORTA members. Mary Kay Myers was thanked for the lovely table decorations of potted pansies, vintage photos and family tree placemats and also for ordering the items for Teacher Appreciation Day on May 7th. A maple pecan creme pie, baked by Pat Rinehart, was auctioned to benefit the Teacher Grant Fund. Upcoming events include: Executive Board meeting-April 29, 10:30 a.m., Edison UM Church; Seniors-Strut Your Stuff, May 9, County Fairgrounds; 11 a.m. – 3 p.m.; Luncheon meeting-June 2, Trinity UM Church.